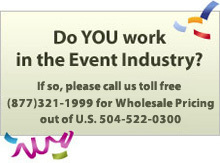 The wild party never stops with our Mardi Gras Confetti and Streamer Products! Parades, parties, and balls will be the BEST yet when you use Flutter FETTI Products! Ready to super-size your Mardi Gras festivities? Keep the excitement going strong with Mardi Gras confetti and streamer effects from The Flutter FETTI Fun Factory! We’re here to create the ULTIMATE Mardi Gras experience, so get ready to shower people with FUN and FETTI! Hitting one of the many parades? We know just how to get the crowds excited and cheering! Add to the spirit of Mardi Gras with the flick of a wrist and confetti in the air. Beads will definitely be tossed your way and the crowd will love the party atmosphere. Try our Flutter FETTI Confetti Sticks, Swisher FETTI, Hand Flick Corkscrew Sticks, and our Airless Confetti Launchers, all available in purple, green, and yellow. Now is the time to get a little crazy and have FUN! Our easy-to-use (and super easy to clean up) party decoration products will take your Mardi Gras celebration to the next level! Celebrate the Season with our Fun Filled Mardi Gras Party Decoration Products! “Flutter FETTI is so much fun! We order the 14" sticks for Mardi Gras every year (we walk in a parade on Mardi Gras morning). They are so festive and people in the crowd just LOVE to be showered with confetti!” Kim S.
“I am very very pleased with our confetti sticks. We order over 500 and received as promised. Our Mardi Gras Royalty will be using them very shortly for our Krewe of Gemini XXVI Grand Bal & Tableau!” Bernadette B. “Ordered 8 launchers with just streamers, no confetti. Order came in VERY fast and when used, a storm of streamers came out from the double-sided launchers. So easy to use and the visual effect was top notch. Next Mardi Gras....we'll do it again.” Rob D.